I choked when my intern, Luca, told me that the kids are basically down with Bape and that "old pieces" (like from '07) go for $$$ on eBay. Regardless of how I feel about it, this is the proof of the popularity. 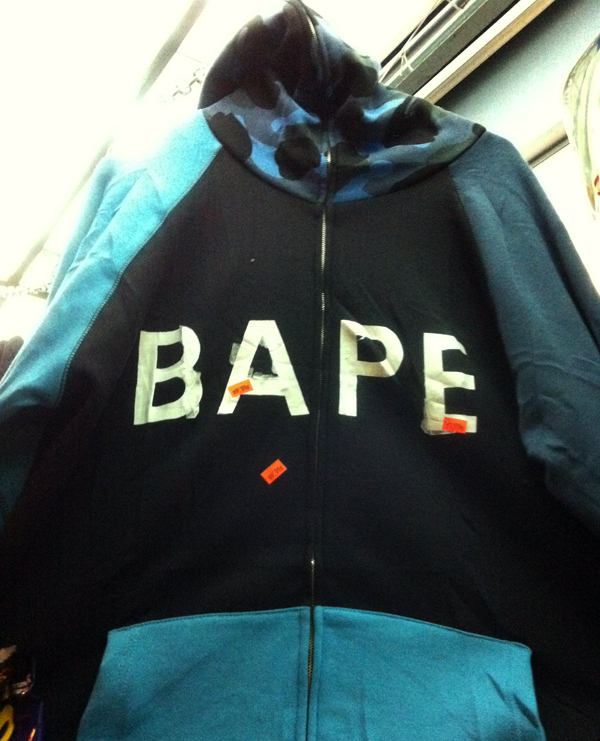 A $9.99 Bape bootleg hoodie with camo hood and the cheapest iron-on letters I've ever seen. I shot this in deep Woodside - outside of a 99¢ Store - where there is absolutely nothing cool going on. To the left - a 5 dollar barber shop, to the right - a 6 dollar chicken shack. Even the graffiti in the area is all from the late 90's. The bike shop across the street, Bill's Cycles is still full of Huffy's.